When the Spanish Civil War begun Carlos Bayo Alessandri served as a machine-gunner/bomber in the Córdoba Breguet XIXs, where he remained until spring 1937. He then went to Pilots’ School and from there he was posted to the He 51 group. He joined 2-G-3 in November 1937. This unit was equipped with the Fiat CR.32. On 28 December 1937, 16 fighters from Grupo 2-G-3 clashed with nine I-15s and 12 I-16s directly above Teruel. Nationalist pilots were credited with shooting down four ‘Curtiss fighters’ and a Rata for the loss of Antonio López Sert (3-87) of Escuadrilla 1-E-3 (reportedly to small-arms fire). Teniente Bayo (2-E-3) attacked a Chato head-on, scoring some hits. He made a second attack from astern and the enemy fighter began to lose height and crashed behind Republican lines near Villastar. Alférez Javier Allende Isasi (2-E-3) claimed two I-15s while alférez Jorge Muntadas Claramunt (2-E-3) claimed the fourth I-15 and alférez Manuel Vázquez Sagastizábal (1-E-3) claimed the I-16. In the afternoon of 6 January 1938, teniente Manuel Vázquez Sagastizábal and teniente Bayo from 2-G-3 went to the defence of a unit of He 111s that was being attacked by enemy fighters. Vázquez attacked the lower group hitting a Chato, which fell in flames to the east of Teruel, while Bayo was successful in destroying a second Chato. At 08:00 on 29 January, Miguel García Pardo and teniente Bayo spotted Russian tanks moving to attack Nationalist positions at Cabezón, in the Singra sector. They attacked these at low level with machine-gun fire, and shortly after found eleven more tanks attacking to the east of Celadas. Returning to base their ammunition exhausted, they located five tanks on the plain near Singra, with five more behind them. In the afternoon on 12 March, 2-G-3 encountered enemy aircraft attempting to stop the sweeping advance in the Aragon offensive. During the afternoon 18 Fiats, led by capitán Ángel Salas (CO) and capitán Joaquín García Morato, escorted Ju 52/3ms on a raid, and having completed this task made a sweep of the front as far as Híjar, where they encountered 19 Chatos that were escorting 11 SBs. In the ensuing dogfights, capitán Salas claimed one probable I-15, capitán Morato claimed two I-15s while teniente Miguel García Pardo (2-E-3) destroyed one I-15, which fell near Híjar. Teniente Miguel Guerrero García (1-E-3) set fire to another I-15, whose pilot took to his parachute from a very low height. Teniente Julio Salvador (CO 1-E-3) attacked another machine, which began to trail smoke, but he was unable to continue his attack as his Fiat was almost out of fuel; unable to return to his base at Tauste, he had to land at Saragossa. Teniente Carlos Serra Pablo-Romero, teniente Bayo (2-E-3) and teniente de Hemricourt (2-E-3) each were successful in shooting down an I-15. Teniente Manuel Vázquez Sagastizábal (1-E-3) attacked three SBs claiming on of them that crashed while attempting to land near Escatrón. No CR.32s were lost in this combat. 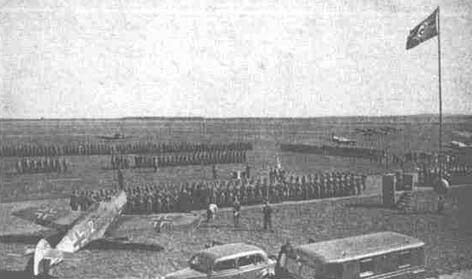 On 4 May, Commander Ángel Salas of 2-G-3 had his fuel and water tanks holed by machine-gun fire from the ground, forcing him to make an emergency landing at Aguilar aerodrome, which had been occupied only days before. During the same sortie the Fiats flown by Bayo, Jorge Muntadas Claramunt and de Hemricourt all received damage from ground fire. In this combat 2-G-3 also claimed four more Ratas (teniente Manuel Vázquez Sagastizábal (1-E-3), teniente Luis Alcocer, teniente Bayo (2-E-3) and teniente Esteban Ibarreche) and one more Katiuska (teniente Salvador Serra Alorda (1-E-3)). On 20 September a series of daily battles began, culminating in fierce combats on 2 and 3 October. Groups 2-G-3 and 3-G-3 fought jointly in all these battles, achieving a total of twenty-five victories (17 by 2-G-3). Of these Bayo claimed four. On 15 October 1938, four squadrons of Fiats made a combined sortie, three from 2-G-3, and one from 3-G-3. They succeeded in destroying two Ratas (Bayo and González Guzmán), one for each group. Capitán Ángel Salas, Manuel Vázquez Sagastizábal and Bayo each damaged another. The battle of the Ebro ended in the middle of November and after this Bayo was transferred to 5-G-5, which was equipped with German monoplanes (Bf 109s and He112s). Bayo, however, didn’t claim anything while flying in this unit. After the end of the war he was decorated with the Cruz Militar (the Military Medal) and promoted for his services during the war. The medal was however not presented to him until the day of Our Lady of Lareto in 1941, by which time he was involved in a new war! Bayo ended the Civil War with 11 biplane victories (and 1 probably destroyed) of which six were I-16s and five were I-15s. The 1a Escuadrilla received a total of 12 Bf 109E-4s and –7s and they were assigned to JG27, VIII FliegerKorps of LuftFlotte 2. They were known as the “15 Spanische Staffel”, and they started to fly their first combat operations on 2 October and suffered its first pilot causality in that same day, when Luis Alcocer was killed in the first mission. Escorting German bombers and reconnaissance aircraft, they operated from 12 different airfields. On 7 October, the Escuadrilla undertook 42 sorties and in the course of the day, Commendante Ángel Salas Larrazábal shot down an “I-18” for his third personal and unit victory while Captain Bayo claimed a damaged MiG-3. On 13 October, Captain Bayo claimed an I-18 while Lieutenant Esteban Ibarreche Arriaga claimed a biplane. On 14 October, Salas in the company with three other pilots in a “free hunt” near Kalinin surprised three DB-3 bombers. In the resulting combat Salas claimed two, while Captain Bayo destroyed the third DB-3, but during the heat of the combat Salas and Bayo collided resulting in Salas Bf 109’s rudder being partially destroyed but he made it back to base. Bayo claimed a DB-3 on 17 October (alternatively on 18 October). During their time in Russia the unit flew a total of 460 missions, were engaged in 94 aerial combats and destroyed 10 enemy aircraft plus four on the ground, for the loss of 5 pilots (one KIFA, three MIA and one KIA) plus one wounded in action. Bayo totally claimed 3 victories and 1 destroyed on the ground during his time in Russia. Carlos Bayo ended the war with 11 biplane victories and a total of 14. All of the biplane victories were claimed during the Spanish Civil War. Bayo passed away on 1 February 1979. Biplane victories: 11 destroyed, 1 probably destroyed, 2 damaged. TOTAL: 14 destroyed, 1 probably destroyed, 3 damaged, 1 destroyed on the ground. (b) 2-G-3 claimed 7 I-15s, 1 probable and 1 damaged and 1 SB destroyed without losses. Republican losses is not known. (d) According to German sources this was claimed as an SB-3. (e) According to German sources this was claimed on 18 October 1941. Additional information kindly provided by Christer Bergström, Ondrej Repka and Tom Semenza.